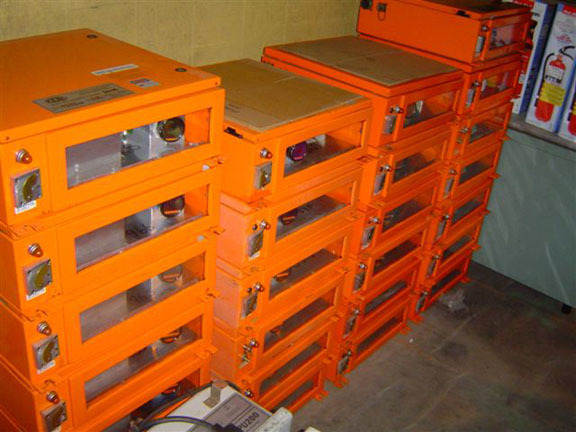 Our scanner repair and calibration facility can upgrade and repair your "Orange Box" or give you immediate turnaround from our stock. We can repair all components from circuit boards to sheet metal. Our solid-state laser replacement usually takes 2 days, including a calibration cycle on our state of the art calibration machine! Your scanner is returned in about a week better-than-new! We also supply Orange Box scanners as a swap with immediate shipment from our stock. Laser scanners emit a beam of coherent (laser) light which reflects from the surface of the log (or any other surface) and into a camera lens that is offset from the laser. In this way, the distance is measured similar to the way your eyes perceive distance because of the offset of your eyes from each other. The reflected "spot" is passed through a lens and focused onto a linear array of 512 semiconductor pixels. The position of the "spot" on the array depends on the distance from the scanner to the target log. The NWD­3950 utilizes spatial information contained in the reflected laser beam to allow us to mathematically provide sub­pixel accuracy, multiplying the resolution of the system. Calibration is achieved by mounting the scanner on a fixture and moving a target through the measurement range, storing position information at each point measured by a high accuracy linear encoder.